If you're transitioning from a position in the military to one in the civilian marketplace, you may be concerned about how to structure your résumé or curriculum vitae (CV) for maximum impact and effectiveness. Ironically, many military and ex-military job seekers are concerned that they will not be seriously considered by prospective employers; however, those who have served in the armed forces usually bring with them a plethora of skills and accomplishments that can benefit corporate entities. Below, we'll explore how to build your military-background CV to land you that civilian job. If you've been in the military for a long time, you may speak in a sort of "jargon" that doesn't resonate with those in the professional world. Therefore, you have to make sure that your CV and covering letter are geared toward someone without military training. Some of the "buzz words" that many corporate men and women are looking for in a CV include "managed", "developed", "team", "won", "strategy", and "self-motivated". Wherever possible, choose active words which "pop" off the page, but don't overdo it or fib. Look through some business magazines and websites as a way to educate yourself on the "lingo" that is used in today's businesses. Most civilian CVs start with the applicant's contact information, then lead into either a personal objective statement or a summary of qualifications (or both). Rarely are photos of the CV writer included, unless the job is for a performing arts or modeling position. Army sergeant with over 10 years engineering experience seeks mid-level position where she can utilize her self-discipline, training, and computer skills to increase profitability. By including this measurable data, the reader of your CV will be encouraged to continue finding out more about what you can offer and will read on. Your next step is to list any educational background which qualifies you for the position. Don't limit yourself to only college/university learning here; certifications you gained during your military training are appropriate, too. If you don't have any "formal" education, you may want to move your education segment to another section of your CV; that way, the prospective employer may be less likely to remove you from his or her list of viable candidates. 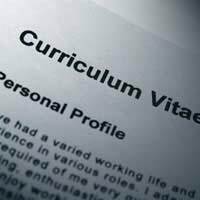 After perusing the education segment, the person analysing your CV will want to know more about your employment history. This arena can feel like a stumbling block for many who have been in the military, because positions in the armed forces may not translate perfectly into a "corporate" format. The final sections of your CV could include your volunteer activities, awards and honors, special skills (relevant to the position for which you are applying), teaching or training positions, published works, and/or references. Some CV writers have also begun to add testimonials, but that might be seen as "overdoing it", so it's probably better to leave them out. Is what I'm considering adding pertinent to the job I want? If I were a personnel manager, would this item be relevant to me? Am I simply adding this because I'm concerned my CV isn't substantial enough? Should you become very stuck, there's nothing wrong with asking a trusted friend, colleague, or loved one to give you specific feedback on the appropriateness and impact of your CV. That way, you'll be certain that you've done everything possible to make a great impression on the people who may be your future employers.